If you are currently in the hospitality industry in Texas and have already received your TABC Certification, you are probably aware of your responsibility to prevent intoxicated customers from getting behind the wheel of a car and driving away from your establishment. In an ideal world, your customers would be aware of their drinking limits and would cut themselves off well before becoming intoxicated if they were planning to drive. Better yet, they wouldn’t have any alcohol if they were planning to drive. And if they did accidentally go over their limit, they wouldn’t even consider driving. Unfortunately, this ideal is far from the truth as there are 95,000 DWIs issued a year in Texas State, which amounts to approximately 260 DWIs per day. AACEA Texas: Simplified Texas State Alcohol Laws You Need To Know! If you work in (or are planning to begin working in) the hospitality industry in Texas State, there are some basic Texas Alcohol Laws that will be helpful for you to know or freshen up on! We have simplified the most basic must-know Texas Alcohol Laws below for your reference. How old do I need to be in Texas State to bartend? How old do I need to be in Texas State to serve alcohol as waitstaff? How old do I need to be in Texas State to conduct alcohol tastings? How old do I need to be in Texas State to enter a bar? If you are working for (or own) an establishment in Texas State that serves or sells alcohol, you may be curious about your legal responsibilities and how to prevent yourself, your employees, and/or your establishment from getting into any trouble with the law. One way to become more knowledgeable about this is to take a TABC Certification course that is approved by the TABC in order to get a TABC License for selling or serving alcohol. If you’re hoping to better inform yourself without taking a course, we have provided some helpful information for you below! One of the biggest concerns you will have as someone who sells or serves alcohol, or as someone who owns an establishment that sells alcohol to the public, is providing alcohol to intoxicated customers. If alcohol is served or sold to an intoxicated customer who then causes an accident or otherwise finds themselves in an accident, you could find yourself knee deep in a Dram Shop Lawsuit. AACEA Texas: TABC Alcohol Seller Server Certification – Can My Certificate Be Revoked? If you have already taken your Alcohol Seller Server training course and received your TABC Certification from AACEA, you may want to know how your certification can be revoked. Ideally, we would like to prevent this from happening to you so we have provided you with a few preventative measures below! First Offense: You will have to take the course and exam over again to become recertified within the first 30 days of the offense, otherwise your certificate will be revoked. Second Offense: If you receive a second violation within 12 months your certification will be revoked and you will not be able to get recertified for 90 days after the offense. Once the 90 days are up you will be required to retake the course and exam again. Thirst Offense: If you receive a third violation within 12 months your certification will be revoked and you will be unable to get recertified for 12 months. AACEA Texas: TABC Certification – Why Should I Get My TABC Server Certificate? Knowledge is power! Understanding Texas’s laws regarding the sales and service of alcohol to intoxicated individuals and minors, and learning how to effectively intervene when you come across an intoxicated individual or minor (or, heaven forbid, an intoxicated minor), is EXTREMELY valuable for playing your part in ensuring that perfectly preventable alcohol-related mishaps and tragedies do not occur. In other words, by becoming certified you will become an even better citizen! Sure, people may not like you very much if you cut them off, but there is honor in upholding your responsibilities as an alcohol seller or server and making decisions with the intention of keeping people safe. In Texas State it is a TABC requirement that all establishments which are licensed to serve alcoholic beverages for customers to consume on-site post two select educational signs for their customers to see. We have listed the signs that are required for On-Premise Licensed Establishments to post below, however, if you are hoping to receive an in-depth training on TABC Texas Alcohol Serving and Selling Laws, or if you need to receive a TABC Certificate in order to work as an alcohol server, we recommend signing up for a TABC Approved Alcohol Server Training Certificate Course. If you serve or sell alcohol in Texas State and check IDs on a regular basis, there is a good chance you will come across a fake ID every so often. One of the best ways to spot a fake ID is to be aware of Texas’s Driver’s License security features, which you can learn more about below! If you’d like to receive a comprehensive training on TABC Texas Alcohol Serving and Selling Laws, or if you need to receive a TABC Certification for your job, we recommend signing up for a TABC Certification Course. Now back to those security features! In Texas State there are currently two styles of 21+ Driver’s Licenses floating around. One was issued before April 2009, and the other was issued after April 2009. The security features on these IDs vary, so we covered both styles below! One of the most important responsibilities of any alcohol server in Texas State is to ensure that minors (those who are under 21 years of age) are not served alcohol. This is to protect yourself and the establishment you work at from liability and to promote public safety. One way the TABC ensures that liquor licensed establishments are following this law is to conduct Minor Sting Operations, and it is in your best interest as a server, liquor license holder, or a manager, to pass any sting operation that happens at your establishment! If you would like to receive an in-depth training on TABC Texas Alcohol Serving and Selling Laws, or if you need to receive a TABC Certificate in order to work as an alcohol server, we recommend signing up for a TABC Alcohol Server Training Course to ensure you are properly educated! If you sell or serve alcohol as one of your job duties in Texas State, you are likely going to find yourself in a situation where you will be required to cut someone off who has had a little too much to drink at one point or another. We know this is not ideal, and the process can be a little uncomfortable if you don’t have much experience, so we put together some helpful strategies for you to use whenever you need to cut someone off in the future. Our goal here is to help you feel more confident in your ability to intervene when a customer has gone past their limit! 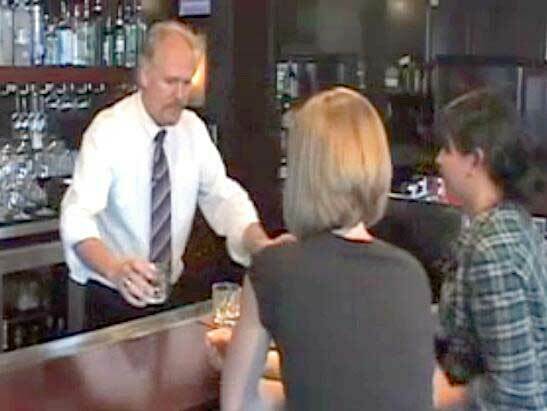 In Texas State it is illegal to sell or serve alcohol to someone who is intoxicated, and observing customers for signs of intoxication is a server’s best course of action for preventing alcohol from being served or sold to an intoxicated customer. Let’s review some Keys to Customer Observation for preventing alcohol sales and service to intoxicated individuals below! First thing’s first, always pay attention to how your customers look! Are their eyes red and watery? Do they look overly tired? Do they smell strongly of alcohol? Next, observe what your customers are doing! Are they struggling to keep themselves balanced when standing still? Has walking become a challenge for them? Do they slur their words when they speak? Are they being overly loud or excited? Are they taking frequent trips to the restroom? Then, observe how your customers are reacting to various stimuli. When you ask them a question, does it take them a long time to formulate an answer? Do they respond to your questions slowly and with great effort? Are they giggling or laughing at your jokes in an overly-animated way? Lastly, keep tabs on how much alcohol has been purchased or consumed by your customers! This shouldn’t be your only method for determining a customer’s level of intoxication since they will often begin drinking at home or in another establishment before frequenting yours, but counting drinks can still provide you with a general idea of where a customer may be at on the BAC scale!